Aims: To compare the expression of the cell adhesion molecules P-cadherin, N-cadherin, and E-cadherin in invasive and in situ breast carcinomas relative to clinicopathological features (size, node status, type, grade, and receptors) to determine whether expression patterns relate to specific tumour characteristics. Methods: Using immunohistochemistry, 110 invasive and in situ breast carcinomas were examined for the presence, extent, and localisation of all three cadherins. Findings were related to tumour size, type, grade, node status, oestrogen (ER), progesterone, and epidermal growth factor receptor (EGFR) expression for invasive carcinomas and to grade and receptors for in situ carcinomas. Results: P-cadherin was detected in 40% of invasive carcinomas, N-cadherin in 30%, and E-cadherin in 81%. For invasive carcinomas, the presence of P-cadherin significantly correlated with high grade, lack of ER and presence of EGFR, but not tumour size or node status. Carcinomas containing P-cadherin could be put into three categories dependent upon receptor and E-cadherin profile. There were no correlations between E/N-cadherin and size, grade, node status, or receptors. Three of 16 infiltrating lobular carcinomas expressed cytoplasmic but none membranous E-cadherin, and P-cadherin and N-cadherin were present in four carcinomas of this type. E-cadherin was found in all ductal carcinomas in situ, P-cadherin in a proportion of high grade tumours, and N-cadherin in a mixture of grades. Conclusion: P-cadherin but not E/N-cadherin expression in breast carcinomas shows a strong correlation with higher grade (poorer differentiation), lack of ERs, and presence of EGFR, and its expression may aid in the further subdivision of high grade carcinomas. Our study compared the expression of P-cadherin, N-cadherin, and E-cadherin in invasive and in situ breast carcinomas in relation to the features of growth, differentiation, and metastasis to determine whether particular patterns of expression are related to specific tumour characteristics. Mouse monoclonal antibody against human E-cadherin was HECD-1 from R&D systems (Abingdon, UK), which is specific for human E-cadherin. The P-cadherin antibody was a mouse monoclonal from Transduction Laboratories (BD Pharmingen, Oxford, UK; clone 56) that had been generated against peptide sequence 72 to 259 of human P-cadherin. The mouse monoclonal antibody to N-cadherin (clone 3B9; Zymed, South San Francisco, California, USA) was raised against a portion of the intracellular domain of chicken N-cadherin and had been shown not to crossreact with other cadherins. The oestrogen receptor was detected using monoclonal antibody 6F11 from Novocastra (Newcastle, UK), the progesterone receptor with PgR636 (Dako, Glostrup, Denmark), and epidermal growth factor receptor with EGFR.113 from Novocastra. All secondary antibodies were from Dako. Heat induced antigen retrieval was used with two minutes of pressure cooking in 0.1M citrate buffer, pH 6.0. The primary antibodies were applied at either a 1/150 (E-cadherin) or 1/50 (N-cadherin and P-cadherin) dilution and incubated for 18 hours at 4°C. This was followed by biotinylated rabbit antimouse immunoglobulin antiserum at a 1/400 dilution and streptavidin–biotin–peroxidase complex. Peroxidase was developed with diaminobenzidine–hydrogen peroxide and sections were counterstained with Mayer’s haematoxylin. Normal breast was used as a positive control for each batch of staining for E-cadherin and P-cadherin (epithelium and myoepithelium, respectively), and cerebellum as a positive control for N-cadherin. The negative control was omission of the primary antibody. Oestrogen and progesterone receptors were detected as described previously.21 The epidermal growth factor receptor antibody was applied at a 1/20 dilution following two minutes of pressure cooking, as above, and was detected using streptavidin–biotin–alkaline phosphatase with nitroblue tetrazolium/BCIP (5-bromo-4-chloro-3-indoxyl phosphate) development. For all cadherins, the extent of staining was assessed as described previously,22 and was classified as negative, < 20% of cells staining, 20–50%, 51–80%, > 80% staining, with separate categories for membrane and cytoplasmic reactivity where appropriate. P-cadherin and N-cadherin were assessed independently by AK and RAW, and E-cadherin by JKD and RAW. Discrepancies were then discussed using a double headed microscope and a consensus was reached. Oestrogen and progesterone receptors were assessed using the quick score method, with carcinomas having a score less than 2 being considered negative. Carcinomas were classed as positive for epidermal growth factor receptor when > 50% of tumour cells had membrane staining stronger in intensity than the adjacent normal breast and a normal breast control. The extent of staining for the cadherins was compared with size, grade, node status, and receptor status using the χ2 test, with p values < 0.05 being considered significant. The carcinomas comprised 82 infiltrating ductal carcinomas of no special type, 16 infiltrating lobular carcinomas (two pleomorphic), two tubular carcinomas, and 10 ductal carcinomas in situ. The size range of the invasive carcinomas was 15–80 mm, with a mean of 25.5. There was evidence of lymph node metastasis in 54 invasive carcinomas, 45 were lymph node negative, and nodal status was unknown in one case. The grades for all invasive carcinomas were 12 grade I, 50 grade II, and 38 grade III. The oestrogen receptor was detected in 83% of invasive carcinomas, the progesterone receptor in 69%, and the epidermal growth factor receptor in 18%. Seven of the ductal carcinomas in situ were high grade, two were intermediate grade, and one was low grade. P-cadherin was detected in 40 invasive carcinomas (40%) and three cases of ductal carcinoma in situ. It was present at the membrane of cells (24% of cases) and within the cytoplasm (36%), with 20% of invasive carcinomas having both localisations (fig 1). The extent of reactivity varied, with more cases having higher cytoplasmic than membranous staining (table 1). Infiltrating ductal carcinoma with many cells showing membranous staining for P-cadherin, but less cytoplasmic reactivity. Expression was related to size, type of carcinoma, grade, node status, and expression of oestrogen, progesterone, or epidermal growth factor receptors (table 2). Four of the 16 infiltrating lobular carcinomas (one pleomorphic) showed cytoplasmic staining, as did one of the tubular carcinomas. There was a highly significant correlation between both membrane (χ2 = 16.97, 4 degrees of freedom (df), 0.005 > p > 0.001) and cytoplasmic staining (χ2 = 26.88, 4 df, p < 0.001) and grade, with a much higher frequency in grade III carcinomas. Seven carcinomas had high levels of both membrane and cytoplasmic staining and all were grade III. There was no relation between P-cadherin reactivity and size and node status. There was a highly significant correlation between the presence of membranous P-cadherin (χ2 = 33.9, 2 df, p < 0.001) and cytoplasmic P-cadherin (χ2 = 26.4, 2 df, p < 0.001) in > 50% of cells and lack of oestrogen receptor expression. The relation with the progesterone receptor was less significant (membrane: χ2 = 10.1, 2 df, 0.025 > p > 0.01; cytoplasmic: χ2 = 8.7, 2 df, 0.05 > p > 0.025). There was a highly significant relation between the presence of the epidermal growth factor receptor and > 50% cells with P-cadherin staining (membrane: χ2 = 37.8, 2 df, p < 0.001; cytoplasmic: χ2 = 30.69, 2 df, p < 0.001). The three cases of ductal carcinoma in situ that expressed P-cadherin were all high grade, lacked oestrogen receptor expression, but were positive for epidermal growth factor receptor expression. N-cadherin was detected in 30% of invasive carcinomas and four of the 10 ductal carcinomas in situ. Reactivity was predominantly cytoplasmic, but staining of the membrane was also seen in some cases (fig 2), although membranous staining was never seen on its own. Under half of the cases had more than 50% of cells staining (table 1). Infiltrating ductal carcinoma showing cytoplasmic staining for N-cadherin, with occasional membrane staining also. Table 2 shows the correlations with the clinicopathological features. Four of the infiltrating lobular carcinomas were positive, and in two > 50% of cells stained. There was no relation between the presence of N-cadherin and lymph node status (χ2 = 3.8, 2 df, 0.25 > p > 0.1) or histological grade (χ2 = 8.17, 4 df, 0.1 > p > 0.05). Similarly, there were no significant associations between the presence of N-cadherin and size, oestrogen receptor, progesterone receptor, or epidermal growth factor receptor expression. Of the four cases of ductal carcinoma in situ that showed staining three were high grade and one was intermediate grade. This was detected on cell membranes and within the cytoplasm of tumour cells. All infiltrating lobular carcinomas lacked membranous staining, two had < 20% of cells with cytoplasmic staining, and one of the pleomorphic variants had > 50% of cells with cytoplasmic staining. There were four infiltrating ductal carcinomas (all grade III) that completely lacked E-cadherin, whereas all others showed either membranous, cytoplasmic, or combined membranous and cytoplasmic staining. Table 1 shows the extent of staining for E-cadherin. Infiltrating lobular carcinomas were excluded in comparisons between clinicopathological features and E-cadherin (table 3). There were no significant correlations between the presence and extent of membranous or cytoplasmic E-cadherin expression and size, node status, grade, oestrogen receptor, progesterone receptor, and epidermal growth factor receptor expression. Membranous staining in > 80% of cells and cytoplasmic staining of < 50–80% was seen in all ductal carcinomas in situ. This was done separately for the different types of carcinoma. Of the 16 infiltrating lobular carcinomas, one (pleomorphic) expressed all cadherins and one expressed both P-cadherin and N-cadherin, whereas the three cadherins were detected individually in a total of six carcinomas. P-cadherin and N-cadherin were detected together in 13 of the other invasive carcinomas, with 13 being positive for N-cadherin alone, 23 for P-cadherin alone, and 35 lacking both. There was no significant correlation between the presence of P-cadherin and N-cadherin. There were four infiltrating duct carcinomas that lacked E-cadherin; all showed high expression of P-cadherin and were grade III. Nineteen of the 84 carcinomas had > 50% cells positive for both E-cadherin and P-cadherin. Forty eight carcinomas lacked P-cadherin and expressed E-cadherin. Three of the four carcinomas lacking E-cadherin were negative for N-cadherin, seven had > 50% of cells positive for both, and 55 carcinomas expressing E-cadherin lacked N-cadherin. Our study has shown a clear association between the expression of P-cadherin in breast carcinomas and high grade (poor differentiation), along with features that relate to this; namely, lack of oestrogen receptor expression and the presence of epidermal growth factor receptor expression. Within the same group of carcinomas, there was no evidence of a relation between features of differentiation and altered expression of E-cadherin or de novo expression of N-cadherin. When the presence of P-cadherin was considered in relation to pathobiological features, the invasive carcinomas could be placed into different categories: those that were P-cadherin and oestrogen receptor positive and retained E-cadherin (24%); those that were P-cadherin and epidermal growth factor receptor positive, lacked the oestrogen receptor but retained E-cadherin (12%); and a small number (4%) that were P-cadherin and epidermal growth factor receptor positive and lacked both the oestrogen receptor and E-cadherin. These last two categories, totalling 16%, may represent carcinomas that have varying degrees of myoepithelial differentiation, because the presence of P-cadherin and the epidermal growth factor receptor is a feature of these cells. Other studies, using different markers of myoepithelial differentiation (such as cytokeratins 5/6 and 14), have reported incidences of myoepithelial-like carcinomas ranging from one of 12 to 16%.25–28 A recent cDNA microarray analysis that used hierarchical clustering to group breast cancers according to their similarity in patterns of gene expression found a “basal-like” group comprising 15% of breast cancers.29 These studies and our results suggest that there are a proportion of breast cancers with related myoepithelial-like characteristics. In contrast, no particular relations were found between N-cadherin and clinicopathological features. In vitro studies have suggested that N-cadherin expression correlates with invasion and metastasis,17,18 but in our present study no correlation with nodal metastasis was found. This could relate to the degree of expression, which is difficult to determine by immunohistochemical studies. The two breast cancer cell lines used in the in vitro studies had been stably transfected with the N-cadherin gene, with resultant high protein concentrations. Another immunohistochemical study of breast cancer found N-cadherin in 48% of tumours but in only small numbers of cells. It was always cytoplasmic and did not correlate with outcome.16 In our present study, E-cadherin expression did not relate to grade, node status, or receptor status. There have been many immunohistochemical studies of E-cadherin in breast reported but no consistent findings in relation to these parameters. Even when a correlation with grade has been found the level of significance can vary. For example, one group using frozen tissue and the 5H9 antibody found a p value of 0.008, but with fixed tissue and using HECD-1 the same group reported a p value of 0.03.9,30 Interestingly, strong E-cadherin immunostaining has been found to correlate with poor survival for both grade I31 and grade III10 tumours, indicating the problems in understanding the relevance and dynamics of E-cadherin expression. Infiltrating lobular carcinomas are known to lack E-cadherin expression.4 The group of patients that we studied had no evidence of membranous staining, with only one pleomorphic variant having > 50% cells with cytoplasmic reactivity. This carcinoma also expressed P-cadherin and N-cadherin, as did a small number of others, but all showed cytoplasmic staining only. In conclusion, P-cadherin but not E-cadherin or N-cadherin expression in breast carcinomas shows a strong correlation with poorer differentiation, in the form of high grade, lack of oestrogen receptor, and the presence of the epidermal growth factor receptor, and may identify cancers whose behaviour and response to treatment might be different. A Kovacs undertook part of this study under the remit of TEMPUS. J Dhillon was funded for her Intercalated BSc by the Association of Clinical Pathologists and performed part of the work. Takeichi M. Cadherin cell adhesion receptors as a morphogenetic regulator. Science1991;51:1451–5. Gumbiner B, McCrea P. Catenins as mediators of the cytoplasmic function of cadherins. J Cell Sci Suppl1993;17:155–8. Vleminckx KL, Vakaet L, Mareel MM, et al. Genetic manipulation of E-cadherin expression by epithelial tumor cells reveals an invasion suppressor role. Cell 1991;66:107–19. Berx G, Cleton-Jansen AM, Strumane K, et al. E-cadherin is inactivated in a majority of invasive lobular breast cancers by truncation mutations throughout its extracellular domain. Oncogene 1996;13:1919–25. Oka H, Shiozaki H, Kobayshi K, et al. Expression of E-cadherin cell adhesion molecules in human breast cancer tissues and its relationship to metastasis. Cancer Res 1993;53:1696–701. Lipponen P, Saarelainen E, Ji H, et al. Expression of E-cadherin (E-CD) as related to other prognostic factors and survival in breast cancer. J Pathol 1994;189:20–7. Charpin C, Garcia S, Bouvier C, et al. 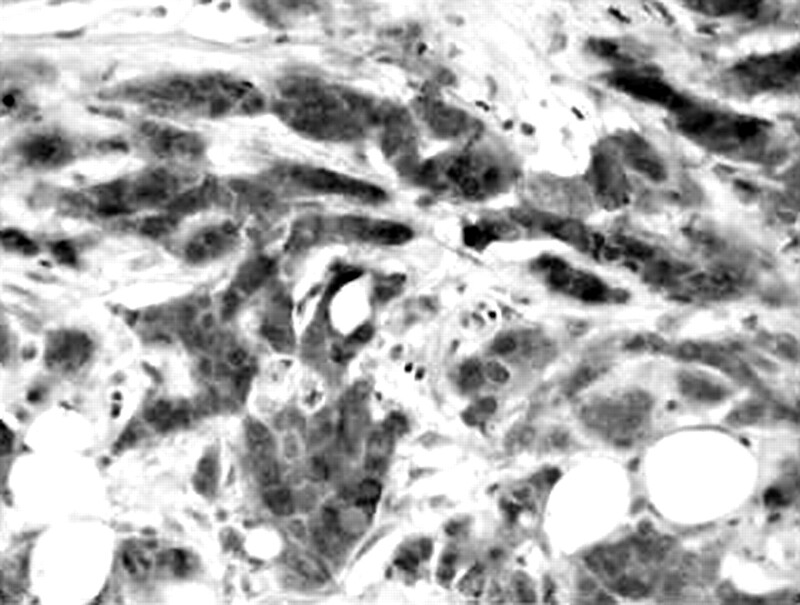 Reduced E-cadherin immunohistochemical expression in node negative breast carcinomas. Am J Clin Pathol 1997;109:431–8. Bukholm TK, Nesland JM, Karesen R, et al. E-cadherin and α-, β-, and γ-catenin protein expression in relation to metastasis in human breast carcinoma. J Pathol 1998;185:262–6. Parker C, Rampaul RS, Pinder SE, et al. E-cadherin as a prognostic indicator in primary breast cancer. Br J Cancer 2001;85:1958–63. Gillett CE, Miles DW, Ryder K, et al. Retention of the expression of E-cadherin and catenins is associated with shorter survival in grade III ductal carcinoma of the breast. J Pathol 2001;193:433–41. Nose A, Takeichi M. A novel cadherin cell adhesion molecule: its expression patterns associated with implantation and organogenesis of mouse embryo. J Cell Biol1986;103:2649–58. Hatta K, Nose A, Nagafuchi A, et al. Cloning and expression of cDNA encoding a neural calcium-dependent cell adhesion molecule: its identity in the cadherin gene family. J Cell Biol 1988;106:873–81. Rasbridge SA, Gillett CE, Sampson SA, et al. 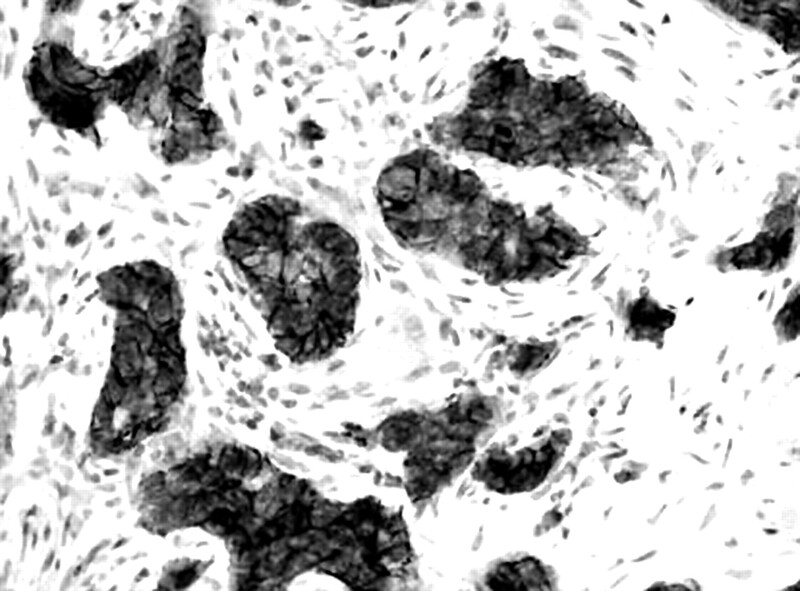 Epithelial (E-) and placental (P-) cadherin cell adhesion molecule expression in breast carcinoma. J Pathol 1993;169:245–50. Palacios J, Benito N, Pizarro A, et al. Anomalous expression of P-cadherin in breast carcinoma. Correlation with E-cadherin expression and pathological features. Am J Pathol 1995;147:605–12. Gamallo C, Moreno-Bueno G, Sarrio D, et al. The prognostic significance of P-cadherin in infiltrating ductal breast carcinoma. Mod Pathol 2001;14:650–4. Peralta Soler A, Knudsen KA, Salazer H, et al. P-cadherin expression in breast carcinoma indicates poor survival. Cancer 1999;86:1263–72. Nieman MT, Prudoff RS, Johnson KR, et al. N-cadherin promotes motility in human breast cancer cells regardless of their E-cadherin expression. J Cell Biol 1999;147:631–43. Hazan RB, Phillips GR, Qiao RF, et al. Exogenous expression of N-cadherin in breast cancer cells induces cell migration, invasion and metastasis. J Cell Biol 2000;148:779–90. Han AC, Soler AP, Knudsen KA, et al. Distinct cadherin profiles in special variant carcinomas and other tumors of the breast. Hum Pathol 1999;30:1035–9. National Co-ordinating Group for Breast Screening Pathology. Pathology reporting in breast cancer screening, 2nd ed. Sheffield: NHSBSP, 1995. Chappell SA, Johnson SM, Shaw JA, et al. Expression of oestrogen receptor alpha variants in non-malignant breast and early invasive breast carcinomas. J Pathol 2000;192:159–65. Jones JL, Royall JE, Walker RA. E-cadherin relates to EGFR expression and lymph node metastasis in primary breast carcinoma. Br J Cancer1996;74:1237–41. Kovacs A, Walker RA. P-cadherin as a marker in the differential diagnosis of breast lesions. J Clin Pathol2003;56:139–41. Paredes J, Milanezi F, Viegas L, et al. P-cadherin expression is associated with high-grade ductal carcinoma in situ of the breast. Virchows Arch 2992;440:16–21. Altmannsbeyer M, Dirk T, Druese M, et al. Keratin polypeptide distribution in benign and malignant breast tumours: subdivision of ductal carcinomas using monoclonal antibodies. Virchows Arch B Cell Pathol 1986;51:265–75. Nagle LB, Bocker W, Davis JR, et al. Characterization of breast carcinomas by two monoclonal antibodies distinguishing myoepithelial from luminal epithelial cells. J Histochem Cytochem 1986;34:869–81. Jones C, Nonni AV, Fulford L, et al. CHG analysis of ductal carcinoma of the breast with basaloid/myoepithelial cell differentiation. Br J Cancer 2001;85:422–7. Wetzeis RH W, Kuypers HJ H, Lane EB, et al. Basal cell-specific and hyperproliferation-related keratins in human breast cancer. Am J Pathol 1991;138:751–63. Perou CM, Serlie T, Elsen MB, et al. Molecular portraits of human breast tumours. Nature 2000;406:747–52. Gonzalez MA, Pinder SE, Wencyk PM, et al. An immunohistochemical examination of the expression of E-cadherin, α- and β/γ- catenins, and α2- and β1-integrins in invasive breast cancer. J Pathol 1999;187:523–9. Tan DS P, Potts HW W, Leong AC K, et al. The biological and prognostic significance of cell polarity and E-cadherin in grade I infiltrating ductal carcinoma of the breast. J Pathol 1999;189:20–7.